If there’s one time of year I get most excited about throws, it’s fall! Even in the summer months, I have to have a throw to stay cozy while napping or watching TV – even if it’s too warm to justify it. So, in the fall months, it’s exciting to actually need a throw for warmth as well! 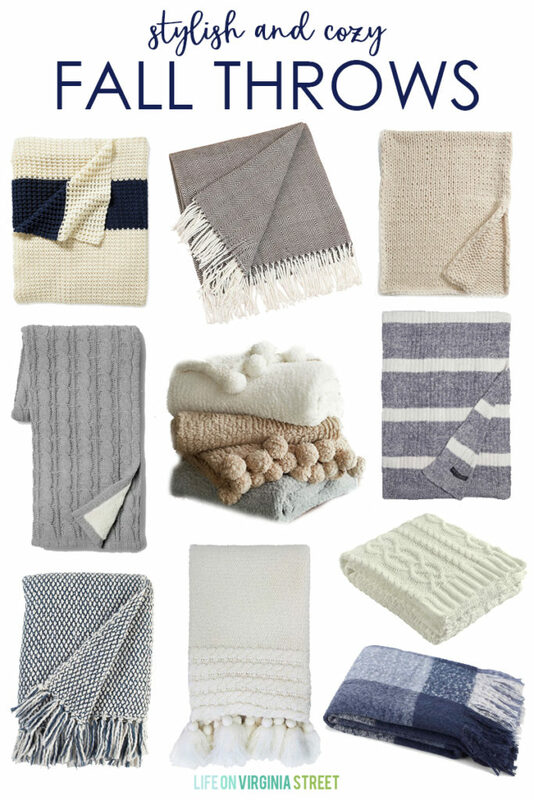 Today I’m sharing a round-up of 20+ of my favorite stylish and cozy fall throws! Before we get into all of the cozy fall throws, I wanted to point out a few specifically. I have this chunky knit throw in our living room and love it! It is really long but not super wide so I love it over the back of a chair to add a cozy vibe. I also thought this knit throw with tassels was perfect for fall and winter and the price is hard to beat! These pom pom throws get rave reviews and are currently 20% off and ship for free with the code FRIENDS. And I always feel like cableknit throws are such a classic style that look just as good in fall as they do the winter months! Following is a collection of stylish and cozy fall throws at a variety of price points. Simply click any of the images below (you may have to double-tap on mobile) and you’ll be taken to that item! Most of these come in a variety of colors, as well! I hope you loved all of these cozy fall throws as much as I do! Subscribe and receive new posts, along with subscriber only content, delivered straight to your inbox! I love, love your blog! Recently you referred to you’re favorite site for prints. It’s on Etsy & you used it for the 4 frames in your gallery. I can’t find link again, would you please share it again? Thanks so much for sharing that one!